Root treatments are designed to not only treat the symptoms of your condition, but also the underlying causes in an effort to rebalance your body and ultimately eliminate the source of your problem. Root treatments are generally longer in duration, and involve a more comprehensive approach to treatment. Results for root treatments usually last longer as we are addressing the "root" cause, rather than just the symptoms. Branch treatments are shorter in duration, as we are mostly addressing the local symptoms of your problem, rather than the intricacies of the underlying cause. Results are still effective, but may not last as long given we are not eliminating the source of your issues. If you've never tried acupuncture before, starting with a branch treatment is a great option. Auricular acupuncture, or acupuncture of the ear, involves the treatment of specific points on the ear to address your symptoms. 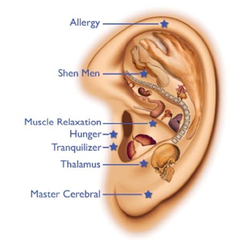 In Chinese medicine, the ear is viewed as a microsystem of the entire body, and therefore points in the ear are able to address issues throughout your entire body. Auricular treatments are shorter in duration, and are often administered while the patient is seated in a chair.